In the two previous posts, I have looked at hypothetical force profiles. Here I present the simulation results on more realistic ones. Figure 1 shows the profiles used in the simulation. As you can see, all are defined by two points (x1,F1) and (x2,F2). The first point defines the handle position at maximum leg force. From that point on, the force can stay on a plateau or go downhill immediately. This is defined by the second point (x2, F2). 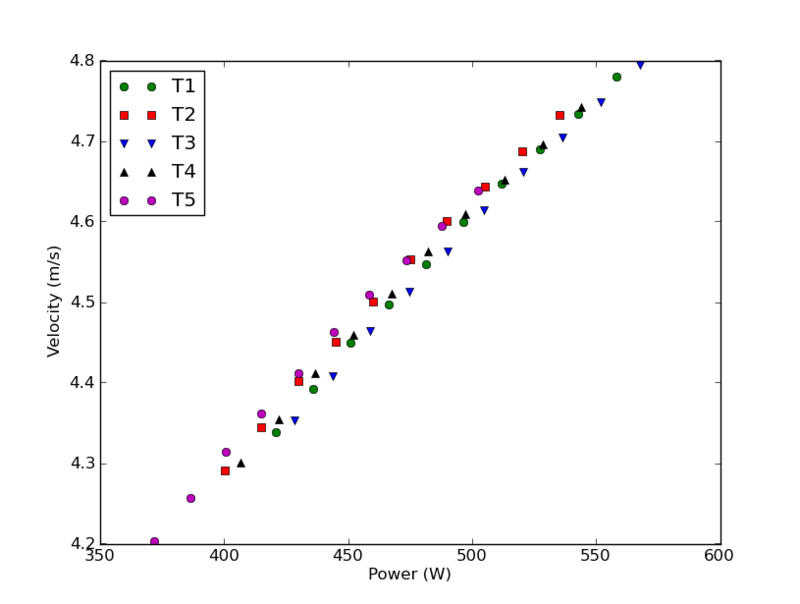 The force curves look more or less like what can be observed on a Concept2 ergometer screen. One could interpret the differences as differences in style, and perhaps also body proportions. For example, T3 could be a rower with shorter legs and a longer torso compared to T2. T5 is equal to “trapezium” in my two previous posts. Figure 2 shows the mean boat velocity achieved for a rower in the single, using standard rigging (catch angle 63 degrees). Each data point represents a different stroke rate, increasing from 25 spm to 35 spm in steps of one stroke per minute. Again, the differences are small. The most efficient strokes seem to be T2 and T5. T3 seems to be the most inefficient. 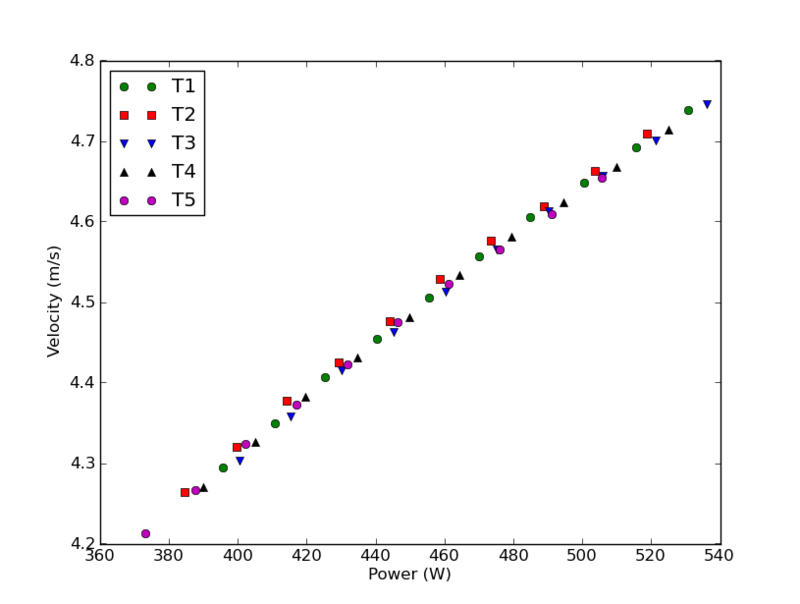 It is interesting to look at the difference between T2 and T3. It seems like keeping a strong stroke as long as possible pays off. This is in agreement with common coaching practices. Figure 3 shows the same plot as figure 2, with a changed rigging. The rower has moved the footboard towards the bow and reduced the catch angle to 43 degrees. Still, the rowing style “T2” is the most efficient, although the differences are reduced. In conclusion, a flatter force profile leads to more efficient rowing, independent of the catch angle, although smaller catch angles are more forgiving. The differences between T2 and T3 are that the short-legged rower T3 has to push harder in the beginning of the stroke to reach the same velocity. He therefore loses more energy due to blade slip. The more balanced stroke of T2 wins. My name is Michael, and I am currently in senior design group that wishes to model a rowing machine in order to supplement a generator to generate electricity. 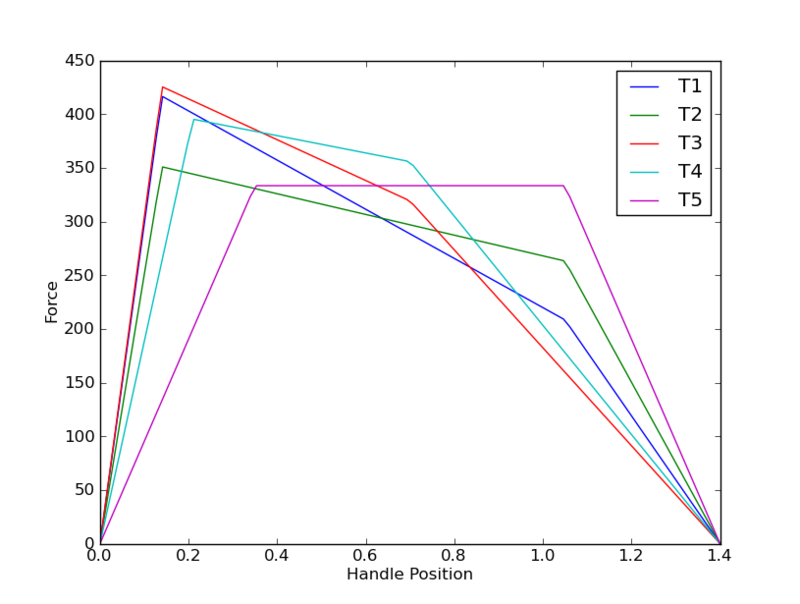 We want to model the force vs handle position curve that you have presented since we also found several similar ones. Assuming we are trying to model the T5 profile, we cannot seem to relate such a force profile to the resistance from the flywheel. We are assuming the the Force on the handle is equal to the drag force produced by the flywheel due to air resistance. The flywheel inertia we will take to be negligible (for simplicity sakes). Therefore, Force = 1/2*ro*v^2*C*A where ro is the density of air, velocity is the airspeed relative to the fan blade, C is the drag coefficient, and A is the projected area by the fan blade. We want to model the profile in curvature but not necessarily in magnitude for now. We are wondering if you have some better insight into our approach or if we are making invalid assumptions. Thanks for your help. You have to take the flywheel inertia into account. During the stroke, the flywheel rotational speed will increase if the torque applied is greater than the drag torque and decrease if otherwise. During the recovery, the flywheel will decrease in speed anyway, so to row at a constant average speed, you will have to increase its speed during the stroke. Have you read this document: http://home.hccnet.nl/m.holst/ErgoDisp.pdf ? Could you reveal a bit more about “wishing to mode a rowing machine in order to supplement a generator to generate electricity”? I am interested in why you would use a rowing machine to generate electricity. Cycling seems more efficient to this purpose, especially if you care about a (nearly) constant power generation. We want to generate electricity to charge portable electronics, in particular an iPod. By adding a generator, an additional torque is added that will affect the original force model. Our criteria for the project would be to replicate the original model after adding a generator in order to match the resistance felt by the user as it was felt without the generator. Thanks for the insight and the article. I’ll definitely look more into the article.